It’s obvious that Big Canoe is working hard to showcase this beautiful mountain retreat that we are so fortunate to call home. Social media is a great way to paint a picture of what Canoe Life is all about. With all of the beautiful fall colors about to peak, we would love your help in highlighting our lively community and how you enjoy the property every day! 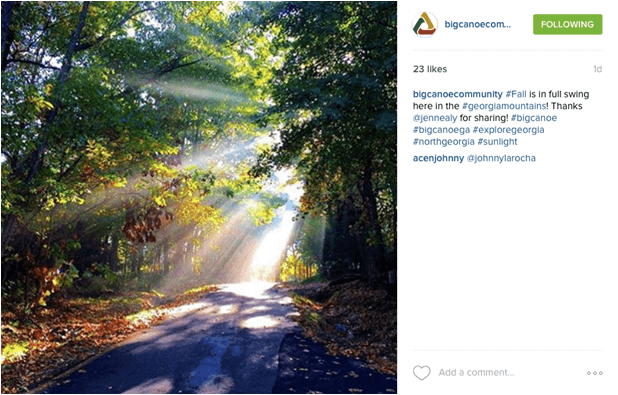 Share your photos and stories on Facebook, Twitter or Instagram by using the hashtag #BigCanoeGA. You can also tag us in your photos with the username @BigCanoeCommunity. We will then share your photos and stories on the Big Canoe Community social media pages. Confused by all of this social media talk? Big Canoe Company is planning to host a training session in January for the community. Stay tuned for more details!